In Southern Africa, Cape Coloureds (Afrikaans: Kaapse Kleurling) is the name given to an ethnic group composed primarily of persons of mixed race. 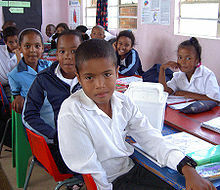 Although Cape Coloureds form a minority group within South Africa, they are the predominant population group in the Western Cape. Extended coloured family with roots in Cape Town, Kimberley and Pretoria. They are generally bilingual, though some speak only Afrikaans and others primarily speak English. Some Cape Coloureds may "code switch", speaking a patois of Afrikaans and English called Kaapse Afrikaans also known as Cape Slang (Capy) or "Kombuis Afrikaans", meaning Kitchen Afrikaans. Cape Coloureds were defined under the apartheid regime as a subset of the larger Coloured race group. The Cape Coloureds are a heterogeneous South African ethnic group, with diverse ancestral links. Ancestry may include European colonizers, indigenous Khoisan and Xhosa people, and slaves imported from the Dutch East Indies (or a combination of all). People from India and the islands within the Indian Ocean region were also taken to the Cape and sold into slavery by the Dutch settlers. The Indian slaves were almost invariably given Christian names but their places of origin were indicated in the records of sales and other documents so that it is possible to get an idea of the ratio of slaves from different regions. These slaves were, however, dispersed and lost their Indian cultural identity over the course of time. Slaves of Malay and other ancestry were brought from India, Indonesia, Malaysia, Madagascar, and Mozambique. This diverse assortment of people was subsequently classified as a single group under the Apartheid regime. Under Apartheid, under the Population Registration Act as amended, the term Cape Coloured referred to a subset of Coloured South Africans, with subjective criteria having been used by the bureaucracy to determine whether a person was a Cape Coloured, or belonged to one of a number of other related subgroups such as the "Cape Malays", or "Other Coloureds". A group of Cape Coloureds were interviewed in the documentary series Ross Kemp on Gangs. One of the gang members who participated in the interview mentioned that black South Africans have been the main beneficiaries of South African social promotion initiatives while the Cape Coloureds have been further marginalised. The award-winning film I'm Not Black, I'm Coloured - Identity Crisis at the Cape of Good Hope (Monde World Films, 2009 USA release) is one of the first historical documentary films to explore the legacy of Apartheid through the viewpoint of the Cape Coloured community, including interviews with elders, Pastors, members of Parliament, students and everyday people struggling to find their identity in the new South Africa. The term "coloured" is currently treated as a neutral description in Southern Africa, classifying people of mixed race ancestry. Since 1994, at the beginning of "The new South Africa", the term Cape Coloured became a badge of honor to this group of people. Once used in the Western countries as well, especially so in North America, the term has shifted in meaning and is now regarded as derogatory in the Western World; a newly-coined term "person of color" has since become common and preferred by the members of the community and the general populace. This term tends to mean any non-white person, as opposed to a mixed-race person, where the term "multiracial" is used. "Coloured" may also be seen as offensive in some other western countries, such as Britain. Tony Ehrenreich, South African trades unionist. Trevor Manuel, former Finance Minister, currently Head of the National Planning Commission of South Africa. Patricia de Lille, former PAC, then Independent Democrats leader, currently Democratic Alliance mayor of Cape Town. Gerald Morkel, the former Premier of the Western Cape. Dan Plato, Western Cape Community Safety Minister. Percy Sonn, former president of the International Cricket Council. Adam Small, political activist, poet and writer. Allan Boesak (Political activist & Cleric). Neville Alexander, Political activist, educationalist & lecturer. Zainunnisa Gool, South African Political activist & representative on the Cape Town City Council. Amy Kleinhans, former Miss South Africa 1992 and first non-white Miss South Africa. Jo-Ann Strauss, Miss South Africa 2000, media personality and business woman. Trevor Jones, South African born film composer. Meryl Cassie, actress from the TV series The Tribe. Jean Grae, hip hop artist. ^ Mid-year population estimates, 2015 (PDF) (Report). Statistics South Africa. 31 July 2015. p. 3. Retrieved 11 August 2015. ^ "The Coloureds of Southern Africa". MixedFolks.com. Archived from the original on 17 May 2008. Retrieved 2009-10-23. ^ "Ethnicity in linguistic variation". ^ de Wit, E; Delport, W; Rugamika, CE; Meintjes, A; Möller, M; van Helden, PD; Seoighe, C; Hoal, EG (August 2012). "Genome-wide analysis of the structure of the South African Coloured Population in the Western Cape". Human Genetics. 128: 145–53. doi:10.1007/s00439-010-0836-1. PMID 20490549. ^ "The Cape Coloureds are a mix of everything : Gene Expression". Blogs.discovermagazine.com. 16 June 2011. Retrieved 2013-01-26. ^ "History of Slavery and early colonisation in SA | South African History Online". Sahistory.org.za. Retrieved 2013-01-26. ^ "Heritage | Memorial". Heritage.thetimes.co.za. Archived from the original on 23 April 2012. Retrieved 2013-01-26. ^ Leach, Graham (1986). South Africa: No Easy Path to Peace. Routledge & Kegan Paul. pp. 70–. ISBN 978-0-7102-0848-4. ^ "Millions Will Watch – The Bloomington Crow". Gotothecrow.com. 3 April 2011. Retrieved 2013-01-26.